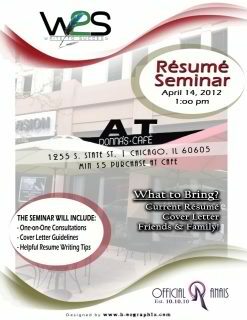 Saturday, April 14th join OfficialAnais and WRITE TO SUCCESS for another RESUME SEMINAR Donna's Cafe Chicago. Get assistance with making over your resume, whether you are employed or seeking employment. There will be valuable information provided on job leads/fairs, resources for ex-felons, and more. RSVP today. This workshop offers effective resume writing workshop offering one-on-one consultations, specific resume guidelines, and cover letter writing assistance. BRING YOUR RESUMES AND COVER LETTERS. The seminar is FREE with a $5 minimum purchase at Donna's Cafe!